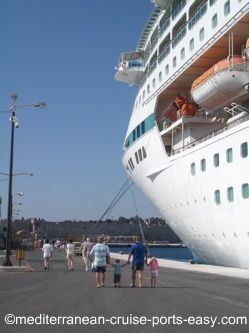 Rhodes cruise ship dock - steps away from the old town! 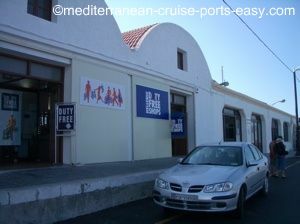 Rhodes cruise ship dock is just a few minutes away from where you want to head - the old town! Getting from Rhodes cruise ship dock to the old town of Rhodes is a real no-brainer. No long tracks, no endless shuttle bus rides, no tender boats...as you can see on our Rhodes map, you could literally pop to the Old town of Rhodes in your pyjamas or head out for an early morning jog along the Rhodes marina. Get off the cruise ship and walk along the pier for about 5 minutes. Towards the end of the pier there will be a Duty free shop for your last minute shopping before getting back on the ship. In the same building you will find the Customs office. It's good to know this, as this is where you could stamp your shopping tax back check in case this happens to be your last EU port or simply if your ship visits a non-EU port the next day! Also, in the same area there is a cafe where mostly taxi drivers and cruise ship crew tend to hang out. Very close to the exit there is a Rhodes taxi stand with an army of taxi drivers who surround you the moment you walk out, hoping to sign you up for a half-day tour around the island or a trip to the beach. Now, exit the dock area and head for an exciting day out! Head on over to the Mediterranean Cruise Ports Easy page on Facebook and become a fan. You will receive notices whenever something new is added to the site and never miss a thing! Feel free to leave comments on the page and interact with other fans, Post your photos and any other links that might interest our visitors too!